1 What Kind Of Greenhouse Plastic Should You Use? 1.1 What Are Your Weather Conditions? 2 What Mil Plastic Is Best For Your Greenhouse? 3 How Do You Measure Greenhouse Plastic? When building a greenhouse, you need to have greenhouse plastic unless you’re building a permanent structure with solid-sheet panels of glass, acrylic, or polyethylene. So what should you use? How do you figure out how much you need, and what’s the best greenhouse plastic for your needs? Today we’ll dive into the world of greenhouse plastic, both film and semi-rigid or rigid, and discover some of the options available to you. What Kind Of Greenhouse Plastic Should You Use? There’s a lot of factors to take into consideration when choosing the best greenhouse plastic. Among these are longevity, UV shielding (or lack thereof), IR shielding, and thickness. Let’s examine some materials and determine what you’ll need. What Are Your Weather Conditions? First off, let’s discuss how your greenhouse is going to be used. If your area is wet and cool during the winter, but not prone to hard frosts, you can get away with something fairly lightweight. You may not even need a greenhouse, although for early seed starting it does help! Suppose your area is wet and cold and you get hard frosts. Then, you’ll probably want something that’s thicker. You probably are going to be using your greenhouse every year, so thinking about the longevity of your plastic is important. If your area gets light snow, you’ll need to consider whether the snow can slide off your greenhouse easily and which has enough thickness to offer good protection against the chilly air. You’re probably also going to want something which can help ensure that sunlight can reach your plants easily. You should still be able to use flexible plastic sheeting still, but you may need to add some form of insulating internal layer to help keep the chill out, perhaps even a secondary layer of plastic. Finally, if your area gets heavy snow, you really need to think about the weight of your average snowpack. You’re going to need to clear the snow off your greenhouse regularly to allow the sunlight in, but you’ll also need warmth inside. Something heavily insulated and rigid is probably your best bet. The least expensive choice and the one that most greenhouse builders choose is polyethylene. There’s a lot of variables in terms of polyethylene, both in sheeting and in panel form. The most common polyethylene plastic sheeting available is utility grade copolymer. 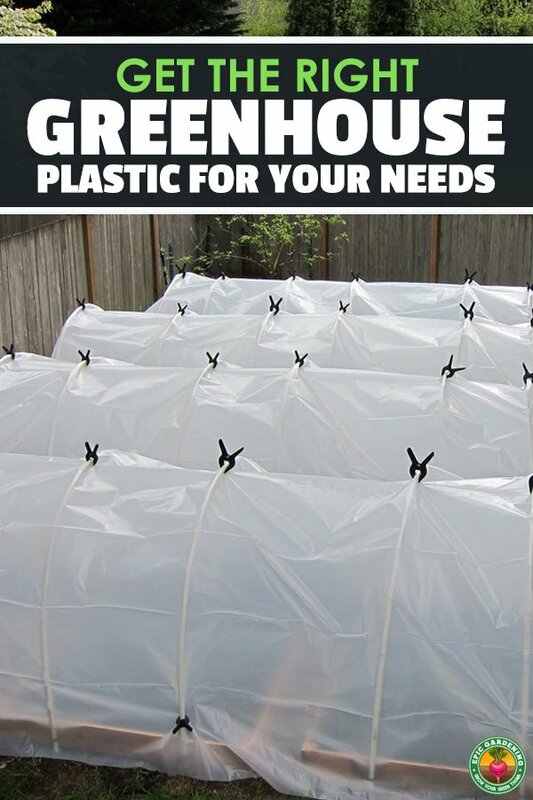 Found at most hardware stores, this greenhouse plastic is extremely inexpensive. In this case, you get what you pay for. This 3mil, 4mil, or 6mil plastic usually won’t last more than a year, and depending on how bad the weather gets, it might not last longer than a single season. You can (and likely should) opt to look for agricultural plastic or greenhouse plastic instead of the utility grade. Agricultural or greenhouse plastic tends to last for much longer periods of time. It can survive for 3-5 years in many cases, and there’s many choices of features for agricultural plastic. However, it does cost more than utility grade. 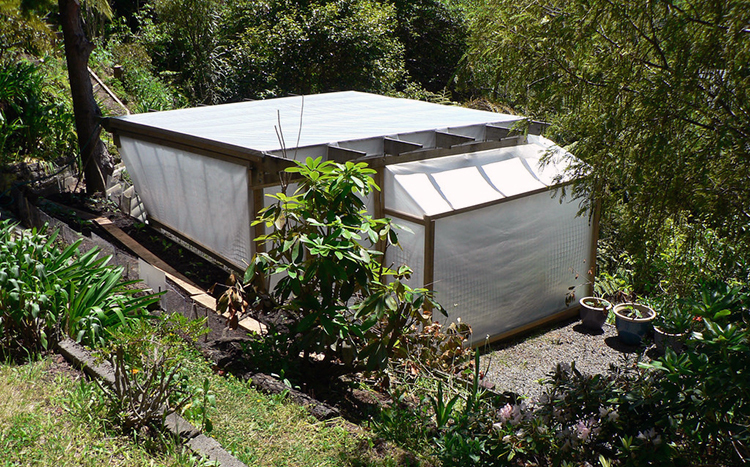 Anti-drip or condensate control greenhouse plastic sheeting is an option. This helps reduce the condensation that will block sunlight. It also prevents moisture dripping onto your plants, which can cause disease issues such as powdery mildew. It can be incorporated into the plastic as an internal layer, or sprayed onto the plastic before use. Heat management is important when dealing with greenhouse plastic sheeting as well. You want to reduce nighttime heat loss. This can be accomplished by using a polyethylene with an IR layer, as it will redirect the heat inside of the plastic. You don’t want to cook your plants, though, and some environments have much warmer daytime hours. In that situation, an infrared-reducing layer is available on the exterior of some greenhouse plastics that will reduce daytime heat gain. If you have a very large greenhouse and plan on using bees as pollinators inside, you will need a plastic that allows ultraviolet rays through. Bees require UV light to find the flowers. However, if you’re not using bees, selecting a plastic that blocks ultraviolet light will help reduce many fungal infections and pests. Some of the pests that can be avoided with this method include thrips, whiteflies, and aphids. Some polyethylene plastic has increased light diffusion. This will help allow light to reach throughout the interior of the plastic, but will help prevent plant scorching. Plastic like this is especially beneficial for people growing taller plants, as it lets light reach the lower leaves without burning the plant top. One note about polyethylene that you absolutely need to know: if using it with PVC pipe, you need a barrier between the pipe and the plastic. Polyethylene has a reaction to PVC pipe which can cause the plastic to degrade if directly exposed to PVC and sunlight for too long. Most people use fabric, such as inexpensive felt or old T-shirt material around the pipe. Masking tape applied to the pipe will also work. If you’re looking for something that’s rigid or semi-rigid, and that isn’t glass or acrylic, you will want polycarbonate. Most commonly, polycarbonate panels are two polyethylene sheets with a corrugated polycarbonate layer between them. These sheets provide insulation while still allowing light through. Much like polyethylene sheeting, polycarbonate plastic has a number of options available. These are typically the same sort of variables as available in polyethylene greenhouse plastic. However, because it’s rigid or only slightly flexible, polycarbonate will last for much longer, and provides more protection in colder winter environments. One other type of plastic which is used occasionally for greenhouse plastic is polyvinyl chloride (PVC). This is the same plastic used to make pipes. While this plastic is extremely durable, it’s also generally only available in shorter lengths than polyethylene sheeting, and it costs significantly more. It’s far more common to find this as an option for greenhouse kits than it is to find it in a long enough length to use for building a polytunnel or other greenhouse. What Mil Plastic Is Best For Your Greenhouse? If you’ve decided on polyethylene sheeting, there’s usually three thicknesses of plastic available. 3mil, 4mil, and 6mil are generally the options. For most single-season applications, 3mil or 4mil is just fine. It’s a great choice for high arched structures, overwintering plants, or single-season use. However, when you’re building a greenhouse that needs to withstand multiple seasons, you’re likely going to want the heavier option of 6mil plastic. Stretched taut over your greenhouse framework, a 6mil plastic will provide good rainshed qualities and act like a much more rigid structure. It will hold up to most light winds. Heavy wind conditions may require extra precautions to be taken to ensure your greenhouse’s stability. How Do You Measure Greenhouse Plastic? First, measure the length, width, and height of your greenhouse. Then measure from the ground on one side up over the arch or peak of the roof and back down to the other side. Make notes of all of these measurements. Your required length and width for the plastic that you need for the top will be the length of your greenhouse plus the over-the-top measurement, plus a foot in every direction. So, for instance, if your greenhouse is 6 feet long and has an over-the-top measurement of 11 feet, you’ll need something that’s about 8′ x 13′. 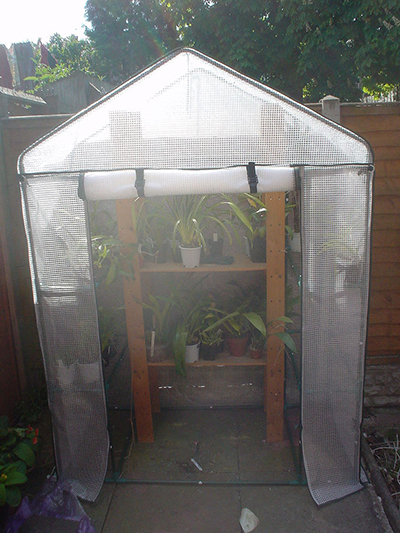 The extra greenhouse plastic ensures you have enough to secure it durably to your frame. The width of the greenhouse and its height, plus a foot in every direction, will be the size of the plastic you’ll need for each of the end walls. So if your height is 5 feet and your width is also 5 feet, you’ll need a 7′ x 7′ piece of plastic for both ends. This 6mil greenhouse plastic has been treated to reduce infrared and ultraviolet sunlight. At 6 mil thickness, it’s certainly sturdy enough to hold up to the weather. It’s mostly clear to offer good light transmission to the plants underneath. The manufacturer says that it will last about four years, and can last longer if regularly cleaned. They offer a limited warranty, but warn that the warranty will be voided if you use it against bare PVC. Be sure to put something between the greenhouse plastic and the pipes! All in all, this is a great solution for most gardeners to choose, and should hold up to the task well. If you live in an area like California where a greenhouse is mostly for pest control and fine-tuning the climate, you really don’t need much more than this visqueen plastic. This utility-grade polyethylene is 6 mil, which gives it a little more durability, but it’s not made to be in the sun for months and months on end. If you’re using it for a single season at a time and then cleaning it and storing it, you may get a couple years out of this plastic. If it’s in the elements for more than a few months, it’s only good for a single use as it’ll begin to deteriorate. If you are constructing a really large greenhouse or are doing a controlled growing environment, this plastic will be great. 6 mil thick and UV-protected, it will hold up well. It’s very slightly more light-diffusing than the top pick, but otherwise is comparable. For the money, you’re getting an excellent size of fabric which should cover even some of the largest greenhouses with no problem. Great for tarp repair also. Let’s face the facts: no greenhouse film will last forever. Inevitably, there will be something that causes tearing of the plastic. And nobody wants greenhouse plastic with big holes in it. Thankfully, Grower’s Solution has a solution for that, too. This poly repair tape is six inches wide and easy to apply. It can be used to quickly repair most light damage to your greenhouse plastic. It’s not going to make your greenhouse covering last forever, nor will it protect from more damage. But it certainly may extend the lifespan by another year or two. So now you know all there is to know about most greenhouse plastic, and which are some of the best greenhouse film options currently available. 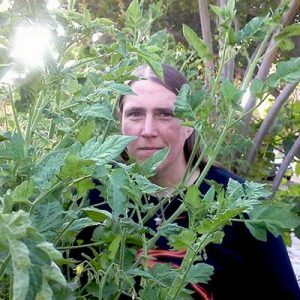 What mil thickness do you use on your hoop house or greenhouse? Do you stretch it super-taut or keep it slightly flexed? Tell your stories in the comments below! Apollo Grow Tent Review: How Solid Are These Tents? First attempt has been a budget half hoop pvc style attached to a privacy fence. The Mrs has been estatic. Sure enough the Lowe’s plastic roll sheeting lasted 10 Mississippi hot, humid months until it shredded. Became brittle and tore in many places when a strong storm blew through. It was about what we expected when we built it. It’s a learning curved greenhouse. Thank you for the insight and recommendations. Moving forward with a vented recover using UV and IR resistant plastic. Upgrading from a plastic flap to a custom door frame. (Fingers crossed on my door build). Hoping next year will be more tweaking and less reconstructing. My best to fellow greenhouse-ers. All of gardening is done on a learning curve, but oh what a fun learning process it is! Best of luck with your upgrade. I think you’ll find the UV/IR-resistant plastic to be great for you. Prices are variable depending on the region you live in and what products are available there. What I’d do in your position is to go do some price comparisons based on what type of plastic you want. While polyethylene plastic is often the cheapest, it also is the most often in need of replacement. Sometimes it’s better to choose a higher-priced plastic that has longer longevity, as it’ll be cheaper in the long run. Best of luck! I’d ask the garden center workers where they carry the greenhouse plastic – I wouldn’t gamble with the clear vapour barriers when you can get some inexpensive greenhouse plastic.